After heavy rainfall in 2015 the Hospital of the Swedish city Jönköping was suffering severe consequences of flooding. That incident was a turning point for the City’s thinking of the impacts of climate change. It had to act now. CLARITY is laying out a strategy to support Jönköping’s efforts for a more liveable city. To prevent incidents caused by flooding and droughts it is important to study water hazards. The cause of flooding and droughts are intense precipitation, river flooding and rise in lake level but also, river flow, flood recurrence or discharge at local rivers. City planners need information about water hazards, when planning new buildings, infrastructure and actions related to water supply. The main problems in Jöngköping are flooding of important infrastructure like it’s hospital or the E4 highway. For the future, new areas for housing and infrastructure must be planned in a way that minimizes the risk of flooding. In Jöngköping CLARITY Project “Service for Water Indicators in Climate Change Adaptation” (SWICCA) and the Swedish Civil Contingencies Agency already gathered information about the risk of flooding and droughts. Our goal is to extend this study by adding information on lake level rise, higher resolution of climate information combined effects of events including entrapped areas. 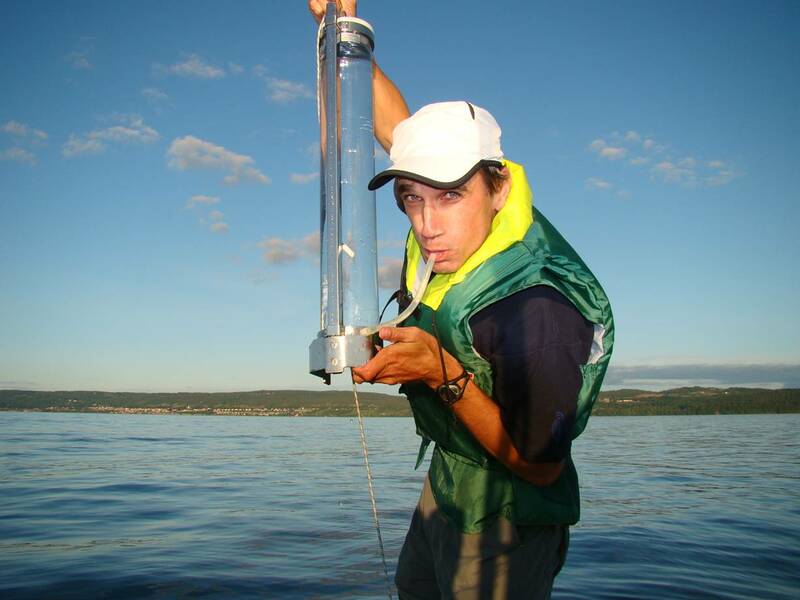 The CLARITY Team testing water quality at Jönköping lake "Vättern"
Based on our work Jöngköping is already taking action. The city has set a new minimum level for new construction projects to over 90.4 meters "above sea level". That is 1.5 meters above the estimated high level for the nearby Lake “Vättern”. Furthermore, the Swedish Civil Contingencies Agency (MSB) made some flood analyses of the River of Tabergsån, which flows through the city of Jönköping. Our work expands to other cities of Sweden, too. In Stockholm a CISIS (CLARITY Climate Services Information System) product allows adaptation planning for issues associated with precipitation and flooding. It is expected to minimize the effects of future flooding on Stockholm infrastructure. Our goals are being able to combine effects of lake level with precipitation and runoff, handle cloud burst events in dense city areas and evaluate the effects of adaptation measures. We lay out risks associated with high precipitation and providing input to the Green Area Factor (GAF). Also analysing the importance of high precipitation, high sea level, and high lake level in the future climate is an important aim. CLARITY recommends that hydrological buffers in the landscape should be used as ecosystem service. The goal is to evaluate and increase the ecosystem services within the landscape to buffer both high and low water regimes and to be able to point out effective areas for geographical allocation of wetlands as hydrological buffers. However, some issues have to be solved first. Wetlands may not be accessible to restore due to new land use or polluted areas. Also water regulation has an impact on natural flows. Specific thresholds within the water coarse need to be identified. SWICCA has released a pre-study where problems and solutions of high relevance are addressed. Still, the cost may involve financing farmers for granting their land to be flooded or barriers at specific places that ought to be cut off from water flows like remedial sites.